Is it time to play in the mud!!? Spring is a time when life is rejuvenated to those aspects of nature that we love so dear. The grass gets greener, the buds on the maples start to pop, the beavers start to do spring housekeeping and repairs on their lodge and some hikers start to dust off their hiking boots. While yes, many of you might not take the winter off, many do take a seasonal hiatus. The black bears start to shake off their cramped muscles and crawl out of their den, some with cubs, and some with just hunger pains. The dozens of species of spring wildflowers will start pushing their way up through the topsoil. Those pesky lady bugs and house flies you thought were dead and trapped in your windows are once again everywhere. Also, don’t forget it’s not called black fly season for nothing; the black flies you love to hate so much begin taking flight. Then last, but surely not least, the water that was once still is rushing downstream and seeping into the ground and producing some of the finest mud the world has ever seen. It's time to hit the trails, but first, let's hit the mud season hiking tips. Here are a few things to keep in mind before you head out this spring. It’s time to break out that sunblock that you so carefully packed away for winter. I guess, overall, there aren’t too many cases of sunburn in the winter seeing as how 90% of your body is already covered with layers of clothing. But as the layers come off, the sunscreen should go on. Be sure to check the expiration on your sunscreen, it does grow old, usually before you can use it up, and like me, you will have some vintage bottles packed away. Expired sunscreen does lose its effectiveness as it becomes older, it will still work but it may need to be applied more often. Bug spray, also known as “bug dope” to some of the “old timers” in the area - I still catch myself saying it on occasion and I get this odd look of, “What are you talking about?” - is mandatory. Whatever you may call it, it is a must for late spring and early summer, but what kind should you purchase? Well, that all depends on how much blood you want to donate to the cause. Some brands work better than others and that is not typically because one brand is more effective, but it might have to do with you. A person’s body chemistry works with or against most repellants, kind of like cologne. Think of bug repellent as stinky cologne, you want it as a repellent that works with your chemistry to make you smell bad to the native insect population. Feel free to try household remedies like eating a household supply of fresh garlic- this works for some people but also usually repels any future of having a hiking partner. There are other types that are all-natural like lemon eucalyptus, which I find works great and doesn’t smell all that bad either. Most of the natural types need to be applied more often. 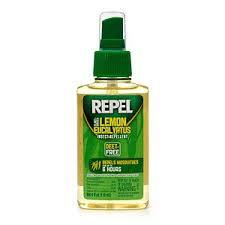 The repellents with deet in them work great, but should not be used on children, unless you want them to develop a third arm (not true). Deet is a chemical that can irritate a child’s developing skin and eyes – as they get older you can start to introduce small amounts of deet based repellent if you wish. But when more natural applications work just as well, why even bother? Mud is good for you, it helps you get over the fact that you cannot be clean all the time, it soothes minor burns, it waterproofs your boots, it quiets the itch of stinging nettles, it coats pine pitch on your hands so it’s not so sticky. In all actuality, people pay for mud baths. It makes your skin glow and eventually suppler, I guess, never tried it, but I have to admit my lower legs are quite shiny. There isn’t much you can do about mud, but it is recommended and requested that you stay off heavily used trails in the High Peaks for a while and focus on less used and lower elevation trails. You could invest in a pair of gaiters; they work well for mud as well as snow, but tend to be very hot and trap unwanted heat. One thing we all ask, is that if you are on a muddy trail, go through it and not around it. It’s essentially a liquid mud-shake that will close back up. The erosion of walking through it is much less than when one walks around it and widens the trail. Essentially, don’t worry about it, it can’t hurt you and it washes off. Heck, if a local eatery won’t turn you away due to a bit of browning, it can’t be all that bad. All kidding aside and to reiterate, mud is the largest factor in spring hiking, especially mid to late spring, and in some cases will continue through a larger portion of the summer. You will see many warnings on the web and in local papers urging hikers to stay out of the higher elevations of the High Peaks Wilderness in spring, while it’s not required please consider other hiking destinations. For more up to date information check out the DEC website. Mud and heavy traffic feeds the erosion process, making our trails much less attractive and battered as time goes on. Water, we often don’t think about it being an issue unless it’s falling from above in the form of torrential downpours – which it will in the spring of the year in the Adirondacks. Water on the ground is what I am talking about, and most importantly in the brooks, streams, and river. Sure, it’s a leading cause in mud production but I already covered that tidbit. Water collects in these many tributaries as snow melt and runoff from the peaks high above you makes its way downstream, often swelling them to overflowing. There are many water crossings in the park that are not aided by bridges but by simpler structures in the form of logs or stepping stones, these could essentially be under water or very slippery. Rushing water is very powerful and fording a moving body of water might not be an option. In cases like this, you may need to turn around and wait out drier weather – a perfect example is the crossing of Indian Pass Brook on the way to Street and Nye. This brook can become a raging torrent as it gets fed by many smaller streams and runoffs. Then, by the time it reached this particular area, it is at a very low elevation and filled to the brim and not safe to cross. Even smaller brooks that you could once jump over can be a battle to cross; care should be expressed at all crossings. Don’t forget, it’s also very cold! Temperatures are a huge misunderstanding in the spring. Many times I have seen hikers unprepared up high because it’s so warm down low. While it may very well be bare ground and 60 degrees at the trailhead, it can be 45 degrees with a wind chill below freezing and 3 feet of snow when you hit that 4000 foot mark, it’s not uncommon at all. Also, at this point in the early season the snow is what we call “rotten.” It has turned to a form closely resembling mashed potatoes and will not hold a hiker up, especially those hiking without the floatation aid of snowshoes. This is where hiking shorts and sneakers end up not being the best idea. So what do you do? First off do research and plan for what could be. 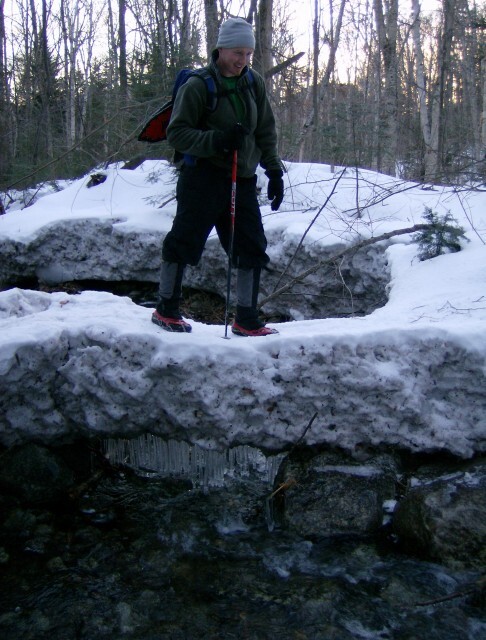 Ask a local information center for details, and check trail conditions on local forums, the ADK, or the NYSDEC. One of these will have the most accurate up-to-date information on trail conditions. Snow in spring is tough to estimate and even harder to battle. Snow above 3000 feet in elevation can linger for much longer than it does at the trailhead. One to three feet of “rotten” snow is very hard to trudge through; it’s cold, slippery, tiring, and could be a bit dangerous if you don’t know what’s underneath. While the trail was once stomped hard from all the traffic, this hard packed surface is simply a narrow spine of no more than 2 feet wide. This developed spine of the once packed trail is getting smaller and smaller, narrower and narrower. If you can stay on it, you can stay above the deep snow underneath, but it’s very hard to stay on it, much less even find it at times, as it's deteriorating fast as well. If you really have to go, if you just have to scratch that itch, it would be a good idea to carry that extra weight of the snowshoes and increase your odds of a successful and safe summit. All in all have a great spring hiking season, I could probably go on and on and I will a bit more in future blogs – but for now happy and safe hiking. If you need some ideas on some great places to go to avoid high elevation hiking be sure to check out what the Wilmington area has to offer for family fun.